Today’s older adults are more mobile than ever. Walking, whether that means a daily visit to the park, or a walk with the dogs around the neighborhood is a key element in keeping health for all of us. It’s not uncommon to see folks 80+ years old in the gym taking a yoga class, or jogging on the treadmill. But while this is means that we are exercising to keep more fit, it doesn’t mean that we are completely immune to the perils of aging. Statistically, in a report posted by the Center of Disease Control (CDC) 1 in 3 adults over the age of 65 have a fall every year. The statistics for the outcomes of these falls are startling. Many of the negative outcomes are related to lack of help immediately after a fall. So, what can you do to be prepared in the event of a fall? Keeping your body strong through exercise is the best preventative measure. Good nutrition and simple good sense. Clear your home of clutter which might cause you to trip. Take things a little more slowly. Of course, no one plans to fall. That’s why we call them accidents. But, it the event of a fall, it’s imperative you have mechanisms in place to receive help as soon as possible. 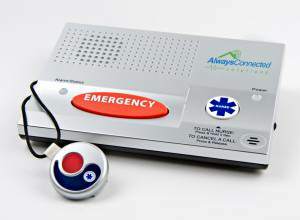 That’s where a medical alert system can be a lifesaver – literally! If you’re a senior who still “gets around” but aware that you fall into that dreaded statistical category of a fall risk, you may have considered having a medical alert system but decided against it because it doesn’t do much good for you when you are out and about. Most PERS (Personal Emergency Alert System) solutions consist of a base unit which is connected to your telephone line and a pendant which can be worn on an necklace or on your wrist like a wristwatch. 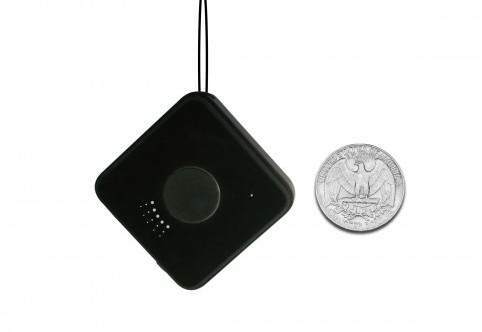 We call it “a button and a box.” The pendant will wirelessly activate the base unit when you press the button. The base unit automatically dials a pre-programmed telephone number to a specialized emergency response that has YOUR information on file. When the unit connected, the base unit goes into a speakerphone mode so that you can communicate with the operator. The speaker on the base unit is quite loud and the microphone is very sensitive to provide coverage in many parts of your home. You are connected to the operator in under a minute and you can communicate with them to let them know of your emergency. They have all of your particulars you’ve shared with them on file can are capable of dispatching emergency help or call someone whom might be able to assist you if you are not in need of emergency services. But the question is: will it work if I am out walking my dog or at the grocery store parking lot? Up until recently, the answer was NO. The NEW answer is a mobile (wireless) PERS device or mPERS. Most traditional PERS units have a range of about 300 feet some up to 1000 feet. Technology comes to the rescue again and has addressed this need. There are several companies which provide a very effective mobile PERS solution. There are upsides and downsides to every product. Most common is the need to re-charge the battery quite frequently, the size and to a lesser extent location technology. Battery life. As this technology is refined battery life has been increasing. Many units require a re-charge every two days. This is due to the GPS unit needing to be on all of the time draining the battery. Some units now boast of a 7-dayThe inconvenience of having to charge your unit every two days is quite limiting for most users. Size. Some mPERS units are designed to be carried or worn in a holster. Quite big and too big to be worn comfortably around your neck. Others are LARGE wristwatches which are usually too big for women or anyone with slim wrists. Plus they are not designed for fashion. Does GPS really work? Most mPERS devices have GPS so that you can be located where you have activated the button. That’s great if the satellite can receive the signal. If you’re in a room of a building and do not know exactly where you are, chances are GPS will be of no use. GPS doesn’t work well indoors. But there is another technology called U-TDOA, Uplink-Time Difference Of Arrival. It’s a technology used by most 911 agencies that use the CELL TOWERS as a way to locate. As we all know, cell phones work pretty well indoors. 1. Speaker and microphone is built into the pendant. No worry about where you are or yelling into some base station. Great for anyone who is hearing impaired. 3. Small. eResponder is 1.75 in square about .75 in thick and weighs slightly over one ounce. 6. Location technology. If you don’t know where you are, they can find you. Uses the advanced locator technology that 911 services use which is considered BETTER than GPS. 7. Affordable: one-time fee for purchase, setup and activation + competitive low monthly fee. NO CONTRACTS. Of course the unit is connected to 24/7 trained responders who know who your are when you call and can contact your family or friends, if needed, as well. For more information visit our website at AlwaysConnectedSolutions.com.